Need some answers? Our Frequently Asked Questions are here to help! If you can't find an answer to your question here, please email us at info@cosmeticcapital.com.au and our customer service team will help you straight away. 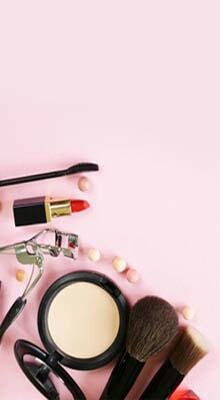 At Cosmetic Capital, we use our unique relationships with cosmetic manufacturers, local distributors, overseas partners, clearance houses, and retail stores, to source the best deals on cosmetics that are available. We literally search the globe for the best deals around. We have forged these relationships over many years. We don’t like to boast, but we are the experts in finding great deals. What are discontinued products and why do you sell them? 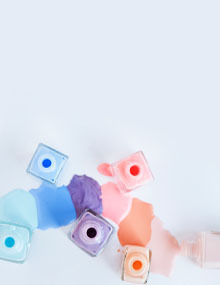 Some of the products we run are ‘discontinued’ cosmetics from the largest companies like L’Oreal (who own the brands L’Oreal, Maybelline, Garnier, Essie), Revlon and Coty (who own the brands Max Factor and CoverGirl). Discontinued products occur when a brand decides it no longer wishes to manufacture a certain product into the future. The brand then deems the product as ‘discontinued’. These products are not expired, are perfect to use, and have often been the best-selling, trusted favourite item to thousands of people for many, many years. However, as these products are no longer being manufactured, once we sell out of our supply, we will never be able to get them again. If you notice that your favourite lipstick or foundation no longer appears in stores, and we have it on sale at Cosmetic Capital, don’t delay, stock up right now because it may be gone forever very shortly! What happens if I have had an allergic reaction to a product I am using? If in the rare instance you have suffered an allergic reaction to a product, please discontinue use of the product immediately, take a photo of the reaction, and email our customer service team at info@cosmeticcapital.com.au who will then assist you with organising a return for this item. Return postage will be at the customers expense. Returns for allergic reactions will be resolved in the form of a store credit. Please note that any product that has been used for an extended period of time, or has had more than 20% of product used, will not be eligible for a return. Why doesn’t my discount coupon code work on all the products in my order? Under our Terms and Conditions, Cosmetic Capital coupons can only be redeemed on regular priced items. We also don’t allow the purchase of gift vouchers with coupon codes. Our sale priced items are already heavily discounted; therefore unfortunately we can’t allow a further discount to be applied to these items. Don’t worry, the savings on a sale priced item are already far greater than any available coupon! Why can’t I redeem my discount coupon with another coupon? At Cosmetic Capital we love providing great discounts and savings across all products in our store. Unfortunately under our Terms and Conditions we can’t allow more than 1 (one) coupon offer to be redeemed at any one time. Please select your preferred coupon at checkout. There is an automatic discount applied to my order. How do I remove this discount? 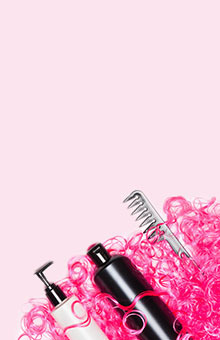 Occasionally at Cosmetic Capital there will be promotions where a discount code is automatically applied to your order. For example, a free shipping voucher when you spend a certain amount. Under our Terms and Conditions, only one voucher can be used at a time. 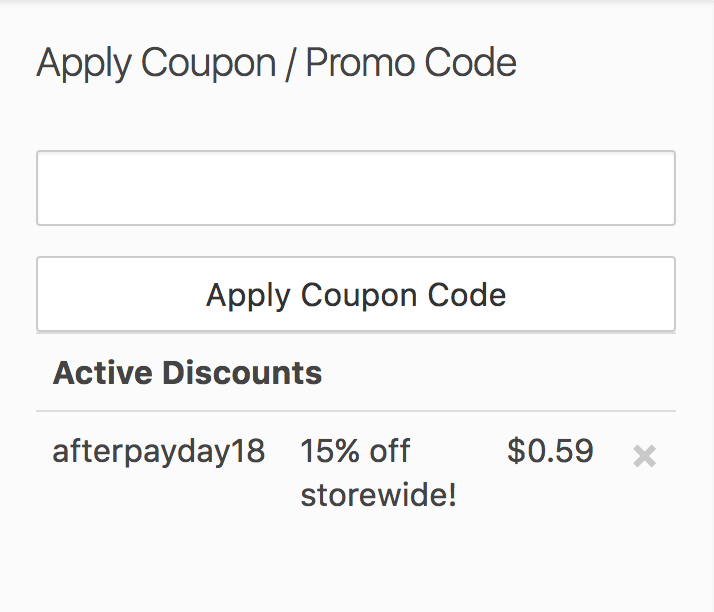 If you would prefer to redeem a different discount, just go into your Cart and remove the automatic voucher by pressing the cross, and then type in the preferred discount code you want to use. How do I redeem my discount coupon at the checkout? Discount coupons can be redeemed on the cart page or at checkout. On the cart page, scroll to the bottom and you will see a tab titled ‘Discount Code’. Here you can now enter your preferred discount coupon. Should you have 2 coupon codes, please note that only 1 can ever be used at any one time. 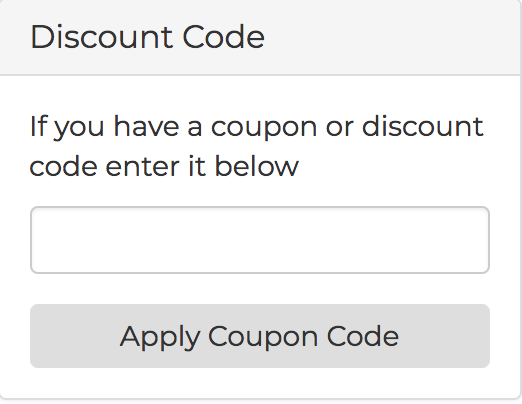 If an automatically applied discount coupon has already been applied, you may elect to remove this and replace it with your desired coupon, by pressing the ‘X’ in the corner to cancel the code. On the checkout page, there is the ‘Apply Coupon / Promo Code’ box at the top right of the page. Here you can now enter your preferred discount coupon. Should you have 2 coupon codes, please note that only 1 can ever be used at any one time. 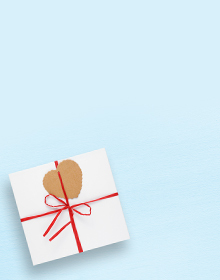 An E-Voucher is a virtual gift voucher. You can purchase this as you would a normal product, by adding to cart. When you checkout, you will be prompted to fill in the Recipient Name for the E-Voucher, a message you may want to add to the E-Voucher, and the recipient’s email address. You will also have the option to select when the E-Voucher should be sent to the recipient. The E-Voucher will be automatically sent immediately, or on the date you have selected, to the recipient’s email address. How do I redeem an E-Voucher? After completing your shopping, proceed to Checkout and fill in your billing and shipping details. After filling in your details, click the blue button ‘+Redeem Voucher’ in Section 3. Payment Details. This will bring up the Voucher box on the right side of the screen. Copy and Paste your Voucher Code and Secret Code that were sent to you with the E-Voucher on email. Click ‘Redeem Voucher’. 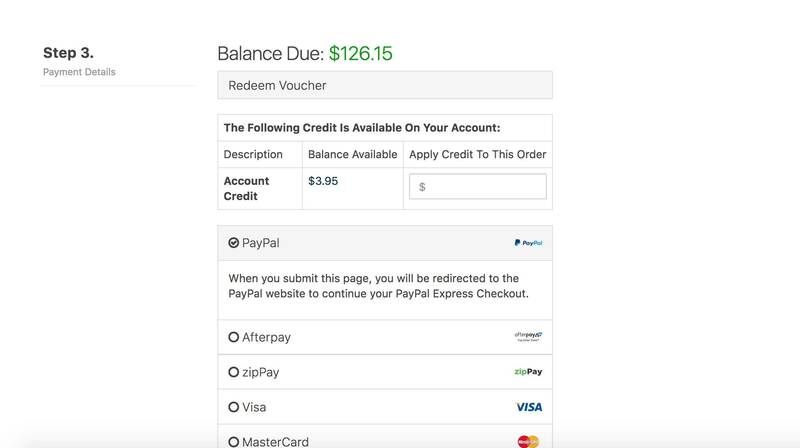 The voucher will now be subtracted from the total order. Note: Your Voucher Code and Secret Code will remain active until you use all the credit. If you have leftover funds after your order, you can use the voucher again on our next order. If you have any issues when redeeming the voucher, please email info@cosmeticcapital.com.au. At Cosmetic Capital we offer free freight for orders over $55 Australia wide. For any order under $55, we charge a flat rate shipping fee of $6.95. Never pay more for shipping no matter how rural your address is, or how many items you add to your shopping bag. Cosmetic Capital also offers Express Shipping, which costs $4.95 for orders over $55 and under 5kg, and $8.95 for orders under $55 and under 5kg. For orders over 5kg, every 1kg over incurs an additional $5 fee. Please note that our shipping rates are subject to change, please check our Terms and Conditions periodically for our updated policy. Do you ever offer shipping discounts? From time to time, Cosmetic Capital will offer shipping discount promotions. These promotions offer half price freight or completely free freight for orders over a specified minimum amount. Shipping discount promotions are limited time offers, and all promotions will stipulate an expiry date. Shipping discount promotions are set up to automatically apply to your order once you pass the minimum spend requirement. Unfortunately shipping discounts cannot be redeemed with other coupon discounts. If you have a preferred coupon code that you would rather use, please feel free to remove the shipping discount, and then enter your preferred code. Please allow 3-5 business days for your order to arrive. Please note business days do not include weekends, or public holidays. If you live in Western Australia, Northern Territory, or country areas in South Australia or Queensland, please allow an extra few days for delivery. What happens if my order seems to be lost? If you have not received your order in the expected time frame, please contact our help team at info@cosmeticcapital.com.au and one of our support agents will be able to assist in resolving the issue. Which courier company do you use to deliver? Cosmetic Capital use a variety of courier companies to deliver our orders. For further enquiries please email our help team at info@cosmeticcapital.com.au. Yes, we do ship to PO boxes. Cosmetic Capital does not currently offer international shipping. However if you are an international customer interested in placing an order with us, please email our help team at info@cosmeticcapital.com.au. Cosmetic Capital offers Express Shipping as an added option when checking out. Express Shipping orders before 1pm will be dispatched that same day; for orders after 1pm, they will be dispatched the following day. For orders under 5kg, Express shipping costs $4.95 for orders over $55, and 8.95 for orders under $55. Why does it say my postcode is not available for shipping? What if my express order doesn't arrive in the time frame stated? Please note: Delivery is controlled by external courier services. Although we endeavour that all orders will arrive in the listed time frames, there are rare instances where the freight service may be delayed. This is outside of the control of Cosmetic Capital, and under our Terms and Conditions we cannot be held liable in these rare instances. Shipping times can vary during busy times of the year. On NSW Public Holidays, our warehouse is closed and our courier services do not pick up, so express orders and regular delivery times will be slightly delayed. During the Christmas period (December), please read our Shipping Policy to ensure that your state is within the guaranteed delivery times for receiving your order before Christmas. Regular shipping and express shipping dates for the Christmas period can be seen here. At Cosmetic Capital we offer free shipping for orders with a product value over $55. Free shipping orders are sent with standard freight, not express. How do I redeem my account credit at the checkout? Account credit can be applied to your account should there be an issue with an order, a product, or a payment that was made incorrectly. Account credit can be used at any time on your future purchases. Please note our Terms and Conditions for further queries related to account credit. To use your credit, please scroll down at the checkout page to where you can see the ‘Balance Due’. Underneath this balance you will see ‘Account Credit’. Now you are ready to ‘Confirm and Process’ your order. Please double check that the credit has been removed from the ‘Balance Due’ before checking out. What happens if I have ordered the wrong item or shade? We all make mistakes, and from time to time you may accidentally order an incorrect item, or the wrong shade of a product. Don’t worry, there are two options available to you. To begin with, please email us immediately at info@cosmeticcapital.com.au stating your order number and the incorrect item you have purchased. If you have made an error and we have NOT dispatched your order, we can either swap the item for the correct item you meant to order, or should that not be available, we can refund you for the incorrect item and remove it from your order. If your order has been dispatched, please feel free to return the incorrect item back to us for a refund for the product. You will need to pay for the shipping back in this instance. Before sending any return back, please contact info@cosmeticcapital.com.au to note with our customer service team you are initiating a return. A customer service representative will then provide you with an address for the return. All returns will need to be sent via tracked post, and a tracking number provided. If this doesn’t happen, Cosmetic Capital cannot be held responsible for a missing item. Please read more in our Terms and Conditions on returns procedures. Please note: Products need to be returned in a new and resaleable condition for a refund to be processed. What happens if I have placed the wrong address on my order and it has already been dispatched? If you have entered an incorrect address, your order may get lost in transit. If this occurs, Cosmetic Capital holds no responsibility for this, and unfortunately there is nothing we can do to assist per our Terms and Conditions. In some instances, your order will be returned to Cosmetic Capital. This return cost is charged to Cosmetic Capital by our courier services. Cosmetic Capital will only resend your order after receiving another shipping payment. Should you not wish to pay another shipping fee, Cosmetic Capital will refund your order minus a $10 compensation fee for the costs incurred due to the return. Please read more in our Terms and Conditions for further details. What happens if Australia Post return my order to you? How do I get it reshipped? If Australia Post delivers your order, and you are not home, a card will be left to let you know to pick your order up from the nearest Australia Post Post-Office. If you do not pick up your package in two weeks, the order will be sent back to Cosmetic Capital. This return is charged to Cosmetic Capital. Should you wish to have your order re-delivered, you will need to pay a new shipping fee. Please email us at info@cosmeticcapital.com.au for more information, or read more in our Terms and Conditions. What do I do if I receive a damaged product in transit? At Cosmetic Capital we understand that (unfortunately) freight companies are often less than careful with orders being sent out. We therefore strive to pack all orders in cardboard boxes, with bubble wrap where necessary to avoid damages. 2) Email info@cosmeticcapital.com.au and include your Order ID Number, and the photo of the damaged item. *Please note, customer service will need a photo of the damaged item to resolve your issue, so please make sure this is available. 3) Please follow the prompts, including identifying the issue you currently have, selecting the order number the issue relates to, selecting the product that is damaged, and writing a brief description of the issue. 4) Once completed, a customer service rep will be in touch shortly. Please have a photo ready as they will need this to resolve the dispute. Cosmetic Capital is proud to offer Afterpay and zipPay as a payment option at checkout. There are instances where a customer will go to checkout with Afterpay or zipPay, and the Afterpay or zipPay system will decline to process your order. This is due to the algorithm used by Afterpay and zipPay, and has nothing to do with Cosmetic Capital. Should you wish to understand more about why you have been declined, please contact Afterpay or zipPay. There are instances when you are declined by Afterpay or zipPay that you will be taken back to the checkout page on Cosmetic Capital. Occasionally, Cosmetic Capital receives enquiries that state a customer has had their credit card charged, rather than checking out via Afterpay or zipPay. Please note that Cosmetic Capital cannot charge your credit card unless you enter in your credit card information on the checkout page, and confirm the checkout. 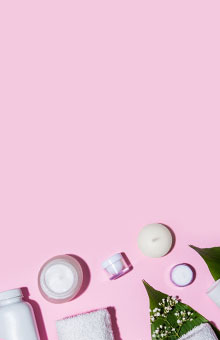 If you have meant to checkout with Afterpay or zipPay, but have mistakenly ended up checking out by credit card and do not wish to continue with your order, please contact customer service immediately to cancel your order at info@cosmeticcapital.com.au. Unfortunately once your order has been dispatched, a refund can only be provided should the order be returned at the cost of the customer. What do I do as your checkout will not process my credit card for payment? If, for some reason, your credit card cannot be processed for payment, we suggest you clear your internet browser and then load our website from a compatible browser such as Google Chrome. If it is still not working, we suggest you checkout via PayPal which is a free payment platform for you to utlilise. 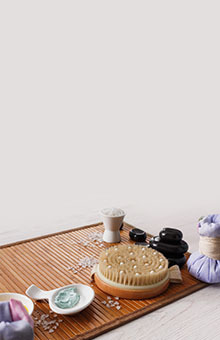 Should you still encounter problems, please contact our customer service team at info@cosmeticcapital.com.au. 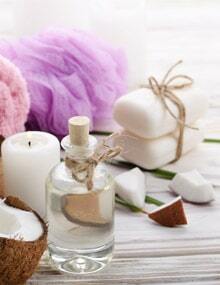 At Cosmetic Capital we strive to dispatch all orders within 1-2 business days from invoice. Once your order has been dispatched, you will receive an email notification confirming this. Please allow 12 hours to receive a tracking email from our preferred courier company. This will be sent to your email address that was used to place the order. 1) At the top of the Cosmetic Capital Home Page, please click to log in to your customer account. 2) Log in to your customer account using your username and password. 3) Once in your account, scroll down to see your recent orders. 4) Press the ‘Track’ button to bring up your tracking number. 5) If this didn’t work, please email customer service at info@cosmeticcapital.com.au and a member of our help team will be available to assist you. Please note: If you checked out as a guest, please contact Customer Service at info@cosmeticcapital.com.au to assist with providing a tracking number. My item looks a bit different to the colour swatch on your website. How come? Colour swatches are often graphic representations of what an item will likely look like when used. These are provided by the brand owners of that item. Please note that graphic swatches are representations, but are not ever 100% exactly the same as what the actual product will look like when used. If you are unsure about an item, and would like to see an actual swatch image rather than a graphic, please email our support team at info@cosmeticcapital.com.au and we will do our best to assist. 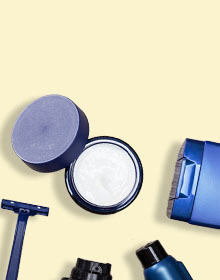 Cosmetic Capital offers a 14 day return policy. Should you change your mind on an item you have purchased, you may send it back to Cosmetic Capital (at your own cost) for a full refund on the product. Please read our Returns Policy before sending a return back to Cosmetic Capital. My shade isn’t correct, what can I do? Sometimes a shade will not meet your expectations. To avoid this, we always suggest looking closely at the provided images, reading online reviews, and if you are still unsure send our customer service team an email, we are always happy to assist! If your item arrives and you realise its not right for you, you can return it in 30 days to us! You can learn how to use Afterpay at our dedicated information page here. You can learn how to use zipPay at our dedicated information page here. Sale priced items have already been reduced to a clearance price, well below any discount available. Therefore no extra discount can be taken on these items. I meet the criteria for wholesale, what now? Please email us at info@cosmeticcapital.com.au OR fill out the form here and a customer service representative will be in touch shortly.